The second part of Great Stuff Recordings momentous 200th release package has landed. It’s a beastly 6-tracker featuring some of the label’s foremost talents and biggest hitters from across the years. 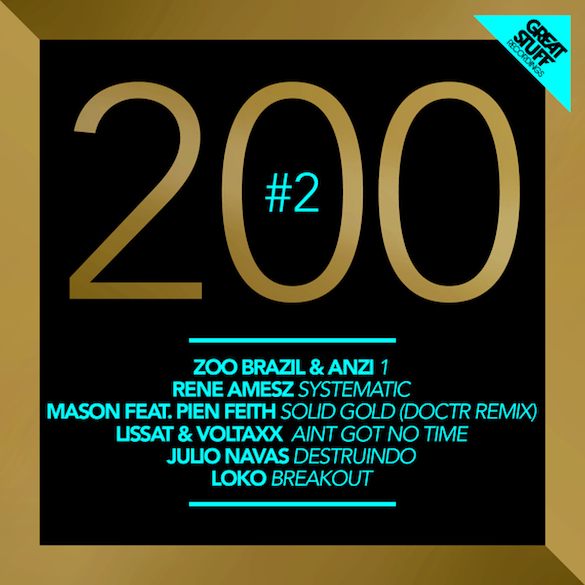 Zoo Brazil & Anzi begin proceedings, kicking the door down with their bouncy beats 1. Trademark frenzied builds supercharge this track’s undulating bassline, rhythmic vocal cuts and atonal synths, making for a real powerhouse of a peak time groove. Dutch master Rene Amesz brings his crunchy beats and swinging rhythms to Systematic, a weighty track filled with warped sounds and chunky drops, topped off with a highly addictive vocal hook. DoctR reworks Mason & Pien Feith Solid Gold, a rolling little number driven by organ bass and shuffling beats and a generally infectious nature. Its relentless hooks and pumping beats will get under your skin in a big way. Lissat & Voltaxx have been amongst the label’s most prolific stars of recent years, and they deliver once again on Ain’t Got No Time. A blissful chime melody graces hard-stomping beats and pummeling bass, making for an exercise in simplicity and succinctness with plenty of character. Julio Navas’ Destruido takes us on a ride through murky bass, dial tones and rousing political vocal samples, churning and whipping everything up into a heads-down, no-nonsense slice of dancefloor potency. Loko’s Breakout finishes off this hefty package in lively style, a funked-up analog bassline zipping away under subtle disco licks and energetic beats and addictive vocal cuts, coming on like a late-‘90s filter house gem updated for 2013.